EGi holds detailed occupier records for tenants across the UK, including lease break and lease expiry details researched by our in-house team. COMPREHENSIVE DATA: Over 4 million occupier records combined with extensively researched lease event details, updated daily. 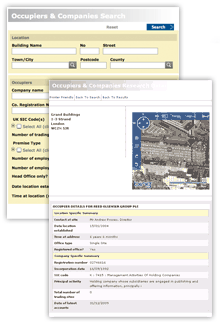 RELEVANT: Search by location, company, lease expiry, lease break, rent review, property use, size and dates. FLEXIBLE: Create mailing lists and analyse data offline by exporting to Excel. See how EGi Occupiers can help grow your business and make informed decisions with a free trial. EGi is the only service that can give you a full 360° view of the property market, offering great value from a single subscription.